Debian buttons is an addon to Mozilla Firefox web browser aiming to make queries to various Debian-related web sites easier. It uses the clipboard contents as a keyword of the query. You see mention of Debian bug #654896 and you want to take a look at it. 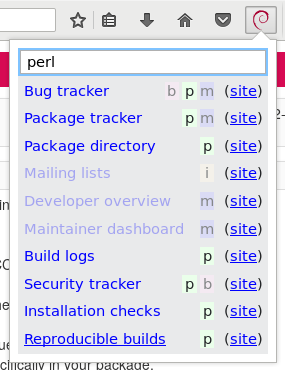 Copy the bug number in the clipboard, click on the Debian swirl button in the toolbar, then choose 'Bug tracker'. Don't worry if the selection contains leading hash or a trailing coma etc. It is cleaned automatically. Clicking on the chosen link with the middle mouse button opens the site in a new browser tab. Same way can be used for looking up a package in the Package Tracking System etc. Copy the input data and press the button you need. The easiest way to install Debian buttons is to use the page at addons.mozilla.org. Debian users would want to use the package (currently providing an old version of the extension). The logo without “Debian” is released under the following common free software license.